Booking a hotel can be done in many situations. You might be on-the-go and need to book on your phone. You may be leisurely surfing for a suitable place and be using your tablet whilst watching TV. Or you may be in the office or at home and using a computer or laptop. Such is the variety, that it is ideal to have a great looking website whomever or however it is being viewed. 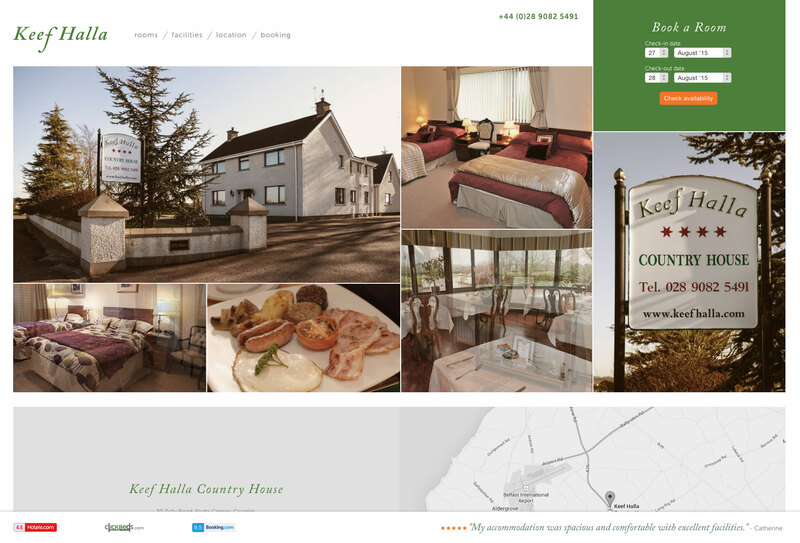 The Keef Halla website was redesigned and redeveloped to be mobile-friendly and display optimal whatever the screen it is seen on. If you are looking for hotel on your mobile, you want the site to load quickly and get the information you need as quickly as possible. It also ought to look great. The mobile version leads with the most important information and images so that it can be used without too much fuss. The key to good mobile sites is to make them simple to update. Back when mobile sites were separate from their desktop cousins, it was easy to update one and not the other. Modern coding techniques enable us to automatically keep all versions up to date - because they all run off the same content as each other. When the visitor uses a display with more real-estate, it is great to let them have a fuller experience. 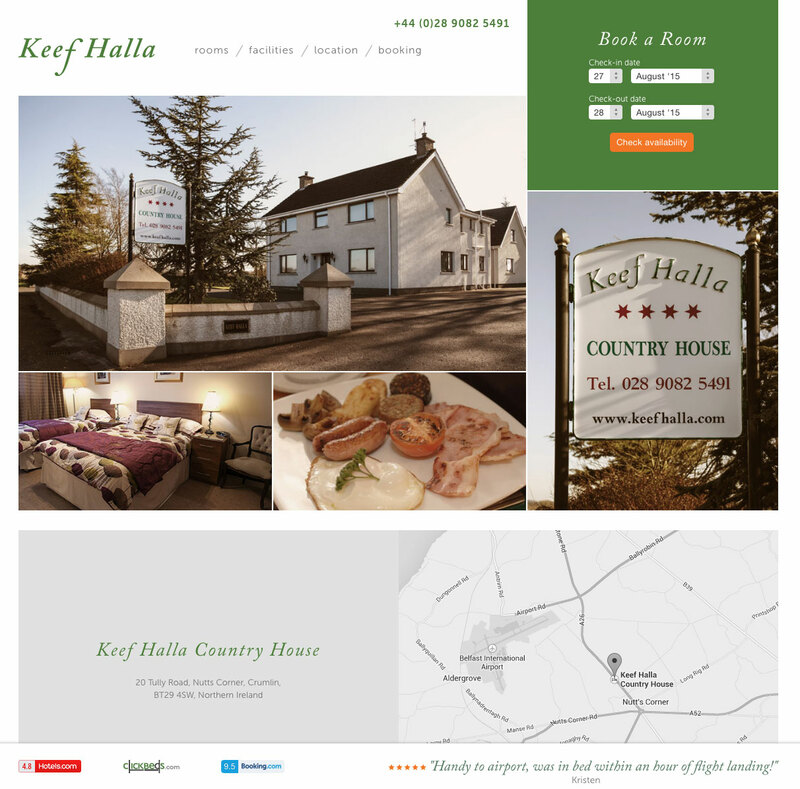 That’s why the Keef Halla site is built to display optimally on smaller computer or tablet screens also. To the non-keen eye, the intermediate version of the site has pretty much the same content al the fullest version, but it has subtly lost a few pictures here or there and altered the size of content in other places to make everything fit in a very flowing way - both visually and communication-wise. There are few things worse than viewing a drastically width-restricted website on a large screen. Such sites look old-fashioned and for good reason. Back in the 1990s, computer screens were so tiny that websites had to be almost half the width they are now. Websites that haven’t been updated, still display as though they need to fit on obsolete computer screens. And of course, they look terribly dated. The fullest screen view of the Keef Halla site has been made to fill a good portion of the screen, and optimally show-off the hotel’s considerable qualities to the utmost.